In the winter of 2008, all my very tidy juniper bushes were munched away by the deer. When spring came, I nursed them back to health. 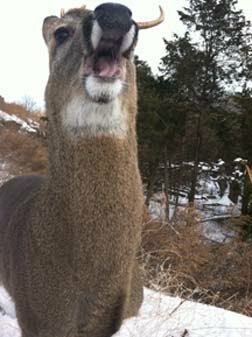 This story starts in mid-December 2009, when I witnessed a deer once again eating my Juniper bushes. Well, upon seeing this one deer on the slope munching away, I went ballistic…went outside and yelled at it (like that ever does any good). That’s when my new friendship and my story begins. That young deer just looked at me and then started hobbling away. The deer had a very mangled foot. How could anyone reprimand an injured deer? Most deer around here travel in small groups. This one was alone. Maybe I could get it to eat something other than my juniper bushes. I decided to name him(her?) Tripod. It took about two weeks until Tripod trusted me enough to come when I called. Of course, there were the apples and the corn-on-the-cob waiting. And there was the fence. I was on the inside and Tripod was on the outside. I guess there was some form of safety for Tripod there. I managed to get close enough to get a good look at (and picture of) Tripod’s foot. There is no way this deer is going to live. I have no clue what happened to the foot but it was really looking bad. That’s when I emailed Antler Ridge with my pictures (Barnyard Rescue posted this story). Kelly Simonetti replied. She said the broken part will probably die and fall off. 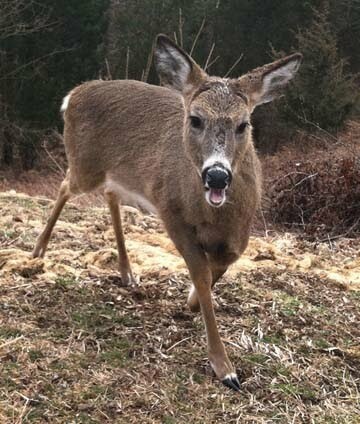 If it heals over before the spring, the deer may have a chance. But there’s this exposed bone…what’s going to happen with that? Kelly informed me that the bone will die up to the knee and that joint will start to separate and as it separates the skin and muscle start to cover below the joint and that's how it heals. Then the dead bone and tissue will fall off. The good news is this takes about 3 months to happen. The cold will help it along. She explained that the Wildlife sanctuary would not come and get Tripod and that capturing the deer would cause it too much stress. I should keep an eye on the leg and supplement Tripod’s diet with one cup of deer food per day. Deer food? What exactly is “deer food?” At this point, even I think I am going nuts as I go off to Tractor Supply to buy “deer food.” Well, Kelly didn’t tell me I had to decide which one of the many types of deer food to buy: the corn (more than two types) or the pellets (at least three types). So I bought corn and pellets. 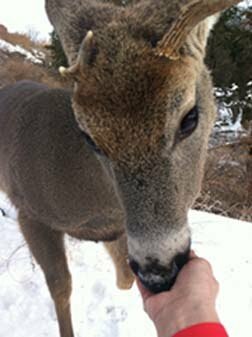 Surprisingly, Tripod began to trust me a bit more and over a period of a month or so was soon eating from my hand: ½ cup of deer food and ½ an apple for breakfast and dinner. Each day before leaving for work and again at dinner time, Tripod would be waiting for his handout. If Tripod wasn’t in his usual resting place, I would simply call him and he would come running up the slope. And now my neighbors are also wondering if I’ve lost my mind. 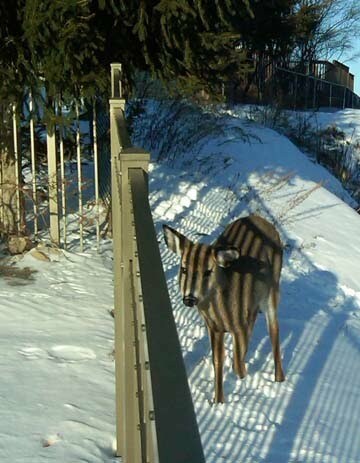 Eventually, I was able to feed Tripod in the front of the house without a fence between us. This relationship continued until the spring. When the huge rain storm came, Tripod disappeared for a week or so. But then reappeared. And then, as the spring progressed and more vegetation was available, Tripod’s visits became less frequent. But the happy outcome of this story is about the mangled leg. I can’t really say that I believed what Kelly said about the leg. I was looking at this mangled mess. Kelly wasn’t. But, as I'm sure she has probably heard many times, she was right. By March, the leg healed. I have to say, I am truly moved by this entire deer experience. 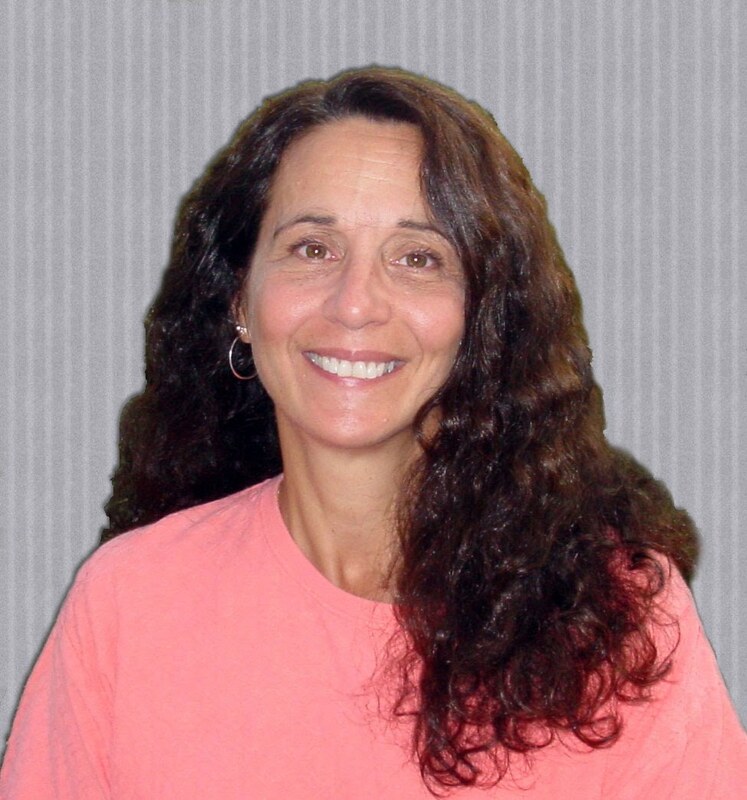 I am a teacher by profession so I have had many rewarding experiences in my lifetime. But this one experience I will treasure forever. January, 2011: This winter is definitely one we won't forget! There was so much snow!!! And then the ice on top of the snow. I often wondered how Tripod was doing. I found myself looking under "his tree" every time I looked out the kitchen window. After not seeing Tripod since June, 2010, I couldn't help feeling a bit worried and sad. Perhaps he didn't make it. Perhaps he got hit by a car. 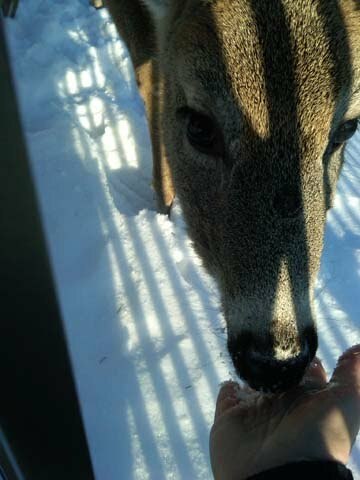 Or maybe he made friends with the other deer around here. Well, on January 24, I arrived home from work, peered out my kitchen window and to my amazement, a three legged deer was staring back up at me. I couldn't cut an apple quick enough. I ran out the back and, yes, this was definitely Tripod! And, to make my day, Tripod was as happy to see me as I was to see him! 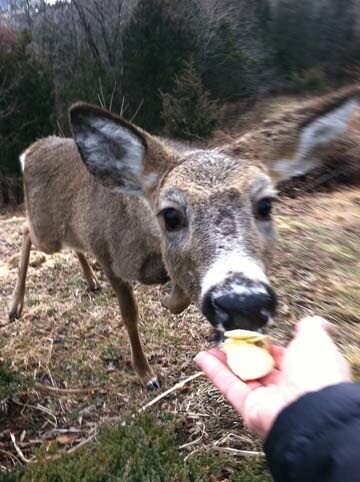 I'm sure the apple helped but he did eat it from my hand that very first encounter. Thank goodness for the camera in my cell phone! No one would believe this! He's hanging out with about 15 other deer now and only visits when the ground is covered with snow. But that's OK. He's back! A surprising summer visit from Tripod! And "he" is most definitely a HE! He's SO big and beautiful now! For sure I have a forever friend. Tripod has paid a few visits this winter. Actually we really haven't had a winter so he's not starving! He does visit for his apple treats, though. It's amazing how he still recognizes who has the apples! He stares up at the house windows waiting for us to come out! And yes, he still responds to "Tripod". It's hard to believe that it has been 4 years since the beginning of this story. Tripod was a surprise guest for New Year's Eve dinner this year and he continues to visit every couple of days. He still loves those apples! He did grow antlers but they have since disappeared. AND, he does seem to have a friend...another male about his size. We have seen them together several times this year. Yes, Tripod still eats from my hand! This is such a unique experience!